Many academic commentators claim that product-service systems (PSS) are moving society towards a resource‐efficient, circular economy (CE) (Tukker, 2015; Piscicelli et al., 2015; Yuan et al., 2006). PSSs shift the businesses’ focus from designing and selling only physical products, to selling a marketable set of products, services, supporting networks, and infrastructures, by including repair and maintenance, updates/upgrades, help desk, training and consultancy, and disposal‐services such as recycling and take‐back (Gaiardelli et al., 2014). Therefore, PSS consists of tangible products as well as intangible services that are combined so that they are jointly capable of satisfying the consumers’ demands (Hockerts & Weaver, 2002). (c) in use‐PSSs, the provider(s) lease, share or pool their product(s); however, they retain the ownership of the product(s). For instance, Koninklijke Philips N.V. (Royal Philips, commonly known as Philips), a diversified technology company utilises the use‐PSS approach, as it provides a lighting service to customers and is responsible for its technology risk. The Dutch company installs its lighting equipment (including street lighting), maintains it, and ensures that it runs for a very long time. Eventually, it reclaims back its equipment when it is the right time to recycle materials. This property rights are distributed amongst Philips and its clients, over the life time of the products. Philips has recognised an untapped opportunity to retain ownership of its products, as it has committed itself to dispose of the infrastructure and its constituent parts at their end of life. At the same time, customers (including the government) do not have to pay high upfront costs for their lighting equipment. Interestingly, Philips is also adopting a similar PSS within health care environments where it has established leasing relationships with clients for its medical infrastructure. Again, the company will eventually reclaim back its equipment and upgrades it when necessary. When the medical equipment is refurbished with the state‐of‐the art technology, the multinational firm will reuse it for another customer; it provides a warrantee cover and guarantees its products as new. The idea of shared ownership is conspicuous with the results‐ and use‐PSSs. These systems have led to upstream effects (through sustainable designs) and increased throughput. As a result, they are sustainable in the long run, as there are less externalities, in terms of waste and emissions. case studies. Cham: Springer Nature. Hockerts, K.,& Weaver, N. (2002). Are service systems worth our interest. Assessing the eco‐efficiency of sustainable service systems. Working document, INSEADFontainebleau, France. Yuan, Z., Bi, J.,& Moriguichi, Y. (2006). The circular economy: A new development strategy in China.Journal of Industrial Ecology, 10(1), 4–8. do’ to ‘doing-well-by-doing-good’ mantra. Evidently, the value-based approaches that were discussed in this paper could be considered as guiding principles that will lead tomorrow’s businesses to long term sustainability (in social and economic terms). Debatably, the profit motive (the business case or corporate sustainability concepts) could be linked with the corporate responsibility agenda. This way, the multinational corporations could be better prepared to address their societal and environmental deficits across the globe, whilst adding value to their business. businesses’ responsible behaviours (i.e. Corporate Responsibility) toward stakeholders including the government, suppliers, customers and the community, among others. The fundamental motivation behind this approach is the view that creating connections between stakeholders in the value chain will open-up unseen opportunities for the competitive advantage of responsible businesses, as illustrated in Figure 1. Multinational organizations are under increased pressures from stakeholders (particularly customers and consumer associations) to revisit their numerous processes in their value chain activities. Each stage of the company’s production process, from the supply chain to the transformation of resources could add value to their businesses’ operational costs as they produce end-products. However, the businesses are always expected to be responsible in their internal processes toward their employees or toward their suppliers’ labour force. Therefore, this corporate sustainability and responsibility perspective demands that businesses create economic and societal value by re-aligning their corporate objectives with stakeholder management and environmental responsibility. In sum, corporate sustainability and responsibility may only happen when companies demonstrate their genuine willingness to add corporate responsible dimensions and stakeholder engagement to their value propositions. This occurs when businesses opt for responsible managerial practices that are integral to their overall corporate strategy. These strategic behaviours create opportunities for them to improve the well-being of stakeholders as they reduce negative externalities on the environment. The negative externalities can be eliminated by developing integrated approaches that are driven by ethical and sustainability principles. Very often, multinational businesses are in a position to mitigate risk and to avoid inconveniences to third parties. For instance, major accidents including BP’s Deep Horizon oil spill in 2010, or the collapse of Primark’s Rana Plaza factory in Bangladesh, back in 2013, could have been prevented if the big businesses were responsible beforehand. In conclusion, the corporate sustainability and responsibility construct is about embedding sustainability and responsibility by seeking out and connecting with the stakeholders’ varied interests. As firms reap profits and grow, there is a possibility that they generate virtuous circlesof positive multiplier effects (Camilleri, 2017). Therefore, corporate sustainability and responsibility can be considered as strategic in its intents and purposes. Indeed, the businesses are capable of being socially and environmentally responsible ‘citizens’ as they are doing well, economically. This theoretical paper has contributed to academic knowledge as it explained the foundations for corporate sustainability and responsibility. Although this concept is still evolving, the debate among academic commentators is slowly but surely raising awareness on responsible managerial practices and on the skills and competences that are needed to deliver strategic results that create value for businesses, society and the environment. The American Institute of Certified Public Accountants’ Jenkins Report may be considered as one of the major documents that has provided the foundations for non-financial disclosures. Notwithstanding, there were other guidelines that were developed by other non-governmental organizations (NGOs), including; the Global Reporting Initiative, AccountAbility, Accounting for Sustainability (A4S), the World Intellectual Capital Initiative (WICI), the Enhanced Business Reporting Consortium, the CDP (formerly known as the Carbon Disclosure Project), the International Corporate Governance Network, the Sustainability Reporting Standards Board and the Climate Disclosure Standards Board, among others. The International Standards Organization (ISO), Forest Stewardship Council (FSC), Greenpeace, Rainforest Alliance and Home Depot Certifiable, Fair Trade and the US Department of Agriculture’s USDA Organic Labelling, among others, have formulated uncertifiable, multi-stakeholder standards and instruments to support organizations in their CSR communication. In addition, certain listed corporations are adopting Fortune’s reputation index, the KLD Social index or RepTrak (Camilleri, 2017). Such measures require corporate executives to assess the extent to which their organization behaves responsibly towards the environment and the community. Despite the development of these guiding principles and indices, their appropriateness remains doubtful (Camilleri, 2015). In 2010, the development of ISO 26000 had represented a significant milestone in integrating socially and environmentally responsible behaviors into management processes. ISO 26000 was developed through a participatory multi-stakeholder process as the International Labor Organization (ILO) had established a Memorandum of Understanding (MoU) to ensure that ISO’s social responsibility standard is consistent with its own labor standards. In fact, ISO 26000’s core subject on ‘Labor Practices’ is based on ILOs’ conventions on labor practices, including; Human Resources Development Convention, Occupational Health and Safety Guidelines, Forced Labor Convention, Freedom of Association, Minimum Wage Fixing Recommendation and the Worst Forms of Child Labor Recommendation, among others. Moreover, ISO’s core subject on ‘human rights’ is based on the Universal Declaration of Human Rights (that was adopted by the UN General Assembly in 1948). On the other hand, many academic commentators argue that ISO 26000 has never been considered as a management standard (Camilleri, 2017). The certification requirements have not been incorporated into ISO 26000’s development and reinforcement process, unlike other standards, including ISO 9000 and ISO 14001. Notwithstanding, ISO 14001 belongs to a larger set of ISO 14000 certifications that conform with the European Union’s Eco-Management and Audit Scheme (EMAS). The European Union (EU) has developed its non-binding guidelines for the non-financial disclosures of large, public-interest entities that engage more than 500 employees (Stubbs and Higgins, 2015; EU, 2014). The European Parliament mandated Directive 2014/95/EU on non-financial reporting; that was subsequently ratified by the European member states. Therefore, large undertakings are expected to disclose material information on their ESG behaviors. These entities are required to explain any deviations from their directive’s recommendations in their annual declaration of conformity, as per the EU’s “Comply or Explain” principle (Camilleri, 2015; EU, 2014). Their non-financial disclosures include topics, such as; social dialogue with stakeholders, information and consultation rights, trade union rights, health and safety and gender equality, among other issues. Moreover, the organizations’ environmental reporting could cover; material disclosures on energy efficiencies, the monitoring of efficiency levels their energy generation capacities, assessments on the co-generation of heating facilities, the use of renewable energy, greenhouse gas emissions, water and air pollution prevention and control from the production and processing of metals, mineral industry, chemical industry, waste management, livestock farming, etc. (Camilleri, 2015). Therefore, large undertakings are expected to bear responsibility for the prevention and reduction of pollution. The EU recommends that the large organizations implement ILO’s Tri-partite Declaration of Principles on Multinational Enterprises and Social Policy, as well as other conventions that promote the fair working conditions of employees. It also makes reference to the OECD Guidelines for Multinational Enterprises, the 10 principles of the UN Global Compact, the UN Guiding Principles on Business and Human Rights, and mentions ISO 26000 Guidance Standard on Social Responsibility (EU, 2014). Following, the EU’s mandate for non-financial reporting, it is expected that 6,000 European public interest entities will be publishing their sustainability reports in 2018, covering financial year 2017-2018 (GRI, 2017). Abstract: The circular economy proposition is not a novel concept. However, it has recently stimulated sustainable consumption and production ideas on remanufacturing, refurbishing and recycling of materials. A thorough literature review suggests that the circular economys regenerative systems are intended to minimise industrial waste, emissions, and energy leakages through the creation of long-lasting designs that improve resource efficiencies. In this light, this research critically analyses the circular economys closed loop systems. The findings suggest that this sustainable development model could unleash a new wave of operational improvements and enhanced productivity levels through waste management and the responsible use and reuse of materials in business and industry. In conclusion, this research implies that closed loop and product service systems could result in significant efficiencies in sustainable consumption and production of resources. Keywords: circular economy; resource efficiency; corporate sustainability; creating shared value; corporate social responsibility; strategic CSR; stakeholder engagement; social responsibility; recycling resources; reusing resources; restoring resources; reducing resources. An excerpt from my latest paper, entitled, “The Integrated Reporting of Financial, Social and Sustainability Capitals: A Critical Review and Appraisal” that will be published by the International Journal of Sustainable Society (this journal is indexed in Scopus). A thorough literature review suggests that the integrated report is more than just a summary of financial, social, sustainability and governance information in corporate disclosures (Adams, 2015). The integrated disclosures constitute a full picture of a company’s overall business performance. Organisations are looking at all aspects of their value-creating capitals, including; financial; manufactured; intellectual; human; social (and relationship); as well as natural capitals (IR, 2013). These capitals complement and compete against each other. Therefore, the practitioners who would like to comply with IIRC’s <IR> framework will probably experience a dynamic process of adaptation, learning and action to redesign their disclosures. They may have to change their internal management systems, processes and strategies to incorporate ESG issues into their core business model (Camilleri, 2015b, Adams, 2015, Churet & Eccles, 2014; Eccles & Krzus, 2010). Relevant academic literature has yielded many recommendations, ideas and concepts that have surely improved corporate reporting (Crowther, 2016). This contribution also reported how “integrated thinking” in corporate reporting involves the inclusion of material information on financial and non-financial matters (Adams & Simnett, 2011). Moreover, it linked the organisations’ integrated reporting with the conceptual developments that were conspicuous in the stewardship, institutional and legitimacy theories, among others. This paper has indicated that these theoretical insights have focused on the rationale for the inclusion of non-financial information in corporate disclosures (Adams et al., 2016; Eccles & Krzus, 2010). Although, there are reasonable arguments in favour and against integrated reporting; in sum, the researcher believes that the IIRC’s framework has proved to be a useful instrument for those responsible organisations who are communicating about their financial and non-financial capitals (IIRC, 2017). The framework contains guiding principles and content elements that will enable organisations to disclose a true and fair view of their holistic activities. Conversely, the avoidance of ESG disclosures from their corporate reports can result in a highly-distorted picture of current and future business activities (Camilleri, 2017). This research has evidenced how the theoretical insights from academic literature have led to the development of integrated reporting. It explained that the organisations’ stewardship behaviours, including their ‘integrated thinking’ can help them improve their legitimacy among stakeholders and institutions. The researcher contended that IIRC’s <IR> framework supports organisations in their holistic reporting approaches as it takes into account material information on financial, manufactured, intellectual, human, social and natural capitals. Indeed, the IIRC’s <IR> framework was a recent development in corporate reporting. This framework has its inherent limitations that were duly pointed out in this paper. However, this contribution maintains that integrated reporting provides a road map for those organisations who would like to pursue the sustainability path (Dacin et al., 2007). The framework is based on the general notion that integrated accounting considers both financial and non-financial information to give a true and fair view of the company’s overall business performance. When practitioners embed ESG disclosures and “integrated thinking” they help to catalyse positive behavioural change within their respective organisation (Adams & Simnett, 2011). This integrated thinking influences the practitioners’ ethical behaviours and their stance on financial and non-financial performance (Camilleri, 2015b). The researcher believes that the framework’s strategic focus calls for both internalisation and externalisation processes. Internalisation is a process through which the organisation’s human resources adopt the framework’s external ideas, opinions, views or concepts, as their own. This process starts with learning about the reporting framework, and why its development makes sense to the organisation, as a whole. The internal stakeholders will probably experience a process of adaptation until they finally accept that their organisation’s integrated reporting of financial and non-financial capitals creates value over time. Thus, the internalisation process can be understood as a process of acceptance of a new set of norms and working practices that will improve the organisation’s performance, in the long term. The organisations’ internal transformation may lead to significant changes in terms of the embeddedness of ESG performance in their operational processes. The non-financial disclosures will shed light on the externalities that affect stakeholders and other unrelated parties. In other words, through integrated reporting; the internal effects of integrated reporting are finally externalised outside the organisations’ boundaries. At times, organisations may intentionally or unintentionally conceal ESG information from stakeholders. Certain unethical practices may result from conscious or unconscious organisational behaviours or simply from misconduct when dealing with extensive information outputs. In conclusion, this contribution suggests that the <IR> framework is a step in the right direction as integrated reporting leads to the re-evaluation of the organisations’ legitimacy (Beck et al., 2015; Dacin et al., 2007; Brown & Deegan, 1998). Hence, IIRC’s framework encourages organisations to report both positive and negative behaviours that substantively affect their ability to create value over the short, medium and long term. Practitioners are also expected to provide an adequate and sufficient context about their strategy, governance and prospects in a balanced way (Camilleri, 2017). Adams, C. A. & Larrinaga-González, C. (2007). Engaging with organisations in pursuit of improved sustainability accounting and performance. Accounting, Auditing & Accountability Journal, 20(3), 333-355. Adams, C. A. & Frost, G. R. (2008). Integrating sustainability reporting into management practices. Accounting Forum. 32, (4), 288-302. Adams, S., & Simnett, R. (2011). Integrated Reporting: An opportunity for Australia’s not‐for‐profit sector. Australian Accounting Review, 21(3), 292-301. Adams, C. A. (2015). The international integrated reporting council: a call to action. Critical Perspectives on Accounting, 27, 23-28. Adams CA, Potter B, Singh PJ and York J (2016). Exploring the implications of integrated reporting for social investment (disclosures) British Accounting Review, 48(3), 283-296. Beck, C., Dumay, J., & Frost, G. (2015). In pursuit of a ‘single source of truth’: from threatened legitimacy to integrated reporting. Journal of Business Ethics, 1-15. Bhimani, A., & Langfield-Smith, K. (2007). Structure, formality and the importance of financial and non-financial information in strategy development and implementation. Management Accounting Research, 18(1), 3-31. Brammer, S., Jackson, G., & Matten, D. (2012). Corporate social responsibility and institutional theory: New perspectives on private governance. Socio-economic review, 10(1), 3-28. Brown, N., & Deegan, C. (1998). The public disclosure of environmental performance information—a dual test of media agenda setting theory and legitimacy theory. Accounting and business research, 29(1), 21-41. Brown, J., & Dillard, J. (2014). Integrated reporting: On the need for broadening out and opening up. Accounting, Auditing & Accountability Journal, 27(7), 1120-1156. Burritt, R. L., & Schaltegger, S. (2010). Sustainability accounting and reporting: fad or trend?. Accounting, Auditing & Accountability Journal, 23(7), 829-846. Camilleri, M. A. (2015a). Valuing stakeholder engagement and sustainability reporting. Corporate Reputation Review, 18(3), 210-222. Camilleri, M. A. (2015b). Environmental, social and governance disclosures in Europe. Sustainability Accounting, Management and Policy Journal, 6(2), 224-242. Camilleri, M. A. (2017). Corporate sustainability, social responsibility and environmental management: an introduction to theory and practice with case studies. Springer, Heidelberg, Germany. Camodeca, R., & Almici, A. (2017). Implementing Integrated Reporting: Case Studies from the Italian Listed Companies. Accounting and Finance Research, 6(2), 121-135. Campbell, D., & Cornelia Beck, A. (2004). Answering allegations: The use of the corporate website for restorative ethical and social disclosure. Business Ethics: A European Review, 13(2‐3), 100-116. Cheng, M., Green, W., Conradie, P., Konishi, N., & Romi, A. (2014). The international integrated reporting framework: key issues and future research opportunities. Journal of International Financial Management & Accounting, 25(1), 90-119. Churet, C., & Eccles, R. G. (2014). Integrated reporting, quality of management, and financial performance. Journal of Applied Corporate Finance, 26(1), 56-64. Crowther, D. (2016). A social critique of corporate reporting: Semiotics and web-based integrated reporting. Routledge. Abington, Oxford, UK. Dacin, M. T. (1997). Isomorphism in context: The power and prescription of institutional norms. Academy of management journal, 40(1), 46-81. Dacin, M. T., Oliver, C., & Roy, J. P. (2007). The legitimacy of strategic alliances: An institutional perspective. Strategic Management Journal, 28(2), 169-187. Davis, J. H., Schoorman, F. D., & Donaldson, L. (1997). Toward a stewardship theory of management. Academy of Management review, 22(1), 20-47. Deegan, C. (2002). Introduction: The legitimising effect of social and environmental disclosures–a theoretical foundation. Accounting, Auditing & Accountability Journal, 15(3), 282-311. Deegan, C 2007, ‘Organisational legitimacy as a motive for sustainability reporting’ in J. Unerman, J. Bebbington, B. O’Dwyer (ed.) Sustainability accounting and accountability, Routledge, London, United Kingdom, pp. 127-149. Deephouse, D. L. (1996). Does isomorphism legitimate?. Academy of management journal, 39(4), 1024-1039.
de Villiers, C., Rinaldi, L., & Unerman, J. (2014). Integrated Reporting: Insights, gaps and an agenda for future research. Accounting, Auditing & Accountability Journal, 27(7), 1042-1067. DiMaggio, P. J., & Powell, W. W. (Eds.). (1991). The new institutionalism in organizational analysis (Vol. 17). Chicago, IL: University of Chicago Press. Donaldson, L., & Davis, J. H. (1991). Stewardship theory or agency theory: CEO governance and shareholder returns. Australian Journal of management, 16(1), 49-64. Dumay, J., Bernardi, C., Guthrie, J., & Demartini, P. (2016). Integrated reporting: a structured literature review. In Accounting Forum. 40(3), 166-185. Eccles, R. G., & Krzus, M. P. (2010). One report: Integrated reporting for a sustainable strategy. John Wiley & Sons, Hoboken, New Jersey, USA. Eccles, R. G., Serafeim, G. & Krzus, M. P. (2011). Market interest in nonfinancial information. Journal of Applied Corporate Finance, 23(4), 113-127. Eisenhardt, K. M. (1988). Agency-and institutional-theory explanations: The case of retail sales compensation. Academy of Management journal, 31(3), 488-511. Erlingsdóttir, G. & Lindberg, K. (2005). Isomorphism, Isopraxism and Isonymism-Complementary or Competing Processes? (No. 2005/4). http://www.lri.lu.se/pdf/wp/2005-4.pdf (accessed 19 April, 2017). EU (2014). Non-financial reporting. http://ec.europa.eu/internal_market/accounting/non-financial_reporting/index_en.htm (accessed 15 November 2015). EU (2015). Implementing the UN Guiding Principles on Business and Human Rights – State of Play. Commission Staff Working Document SWD(2015)144 final.. European Commission, Brussels, Belgium. http://ec.europa.eu/DocsRoom/documents/11621/attachments/1/translations/ (accessed 15 November 2015). EU (2017) Corporate Social Responsibility. European Commission, Internal Market, Industry, Entrepreneurship and SMEs. Brussels, Belgium. http://ec.europa.eu/growth/industry/corporate-social-responsibility_en (accessed 15 November 2015). Fernandez-Feijoo, B., Romero, S., & Ruiz, S. (2014). Effect of stakeholders’ pressure on transparency of sustainability reports within the GRI framework. Journal of Business Ethics, 122(1), 53-63. Flower, J. (2015). The international integrated reporting council: a story of failure. Critical Perspectives on Accounting, 27, 1-17. Hahn, R., & Lülfs, R. (2014). Legitimizing negative aspects in GRI-oriented sustainability reporting: A qualitative analysis of corporate disclosure strategies. Journal of Business Ethics, 123(3), 401-420. Harding, T. (2012). How to establish a study association: Isomorphic pressures on new CSOs entering a neo-corporative adult education field in Sweden. Voluntas: International Journal of Voluntary and Nonprofit Organizations, 23(1), 182-203. Hedberg, C. J. & Von Malmborg, F. (2003). The global reporting initiative and corporate sustainability reporting in Swedish companies. Corporate social responsibility and environmental management, 10(3), 153-164. Higgins, C., Stubbs, W., & Love, T. (2014). Walking the talk (s): Organisational narratives of integrated reporting. Accounting, Auditing & Accountability Journal, 27(7), 1090-1119. Hopwood, A. G. (2009). Accounting and the environment. Accounting, Organizations and Society, 34(3), 433-439. Idowu, S. O., Capaldi, N. & Zu, L. (2013). Encyclopedia of corporate social responsibility. Springer, Heidelberg, Germany. Ioannou, I. & Serafeim, G. (2012). What drives corporate social performance? The role of nation-level institutions. Journal of International Business Studies, 43(9), 834-864. IR (2013). International IR Framework, International Integrated Reporting Council. available at: http://integratedreporting.org/wp-content/uploads/2013/12/13-12-08-THE-INTERNATIONAL-IR-FRAMEWORK-2-1.pdf (accessed 16 May, 2017). IR (2017). Integrated Reporting. International Integrated Reporting Council https://integratedreporting.org/the-iirc-2/ (accessed 19 May, 2017). Lozano, R. & Huisingh, D. (2011). Inter-linking issues and dimensions in sustainability reporting. Journal of Cleaner Production, 19(2), 99-107. Maniora, J. (2015). Is integrated reporting really the superior mechanism for the integration of ethics into the core business model? An empirical analysis. Journal of Business Ethics, 140(4), 755-786. Maniora, J. (2017). Is integrated reporting really the superior mechanism for the integration of ethics into the core business model? An empirical analysis. Journal of Business Ethics, 140(4), 755-786. Meyer, J. W., Boli, J., Thomas, G. M. & Ramirez, F. O. (1997). World society and the nation-state. American Journal of sociology, 103(1), 144-181. Muth, M. & Donaldson, L. (1998). Stewardship theory and board structure: A contingency approach. Corporate Governance: An International Review, 6(1), 5-28. Ness, K. E. & Mirza, A. M. (1991). Corporate social disclosure: A note on a test of agency theory. The British Accounting Review, 23(3), 211-217. O’Dwyer, B. (2003). Conceptions of corporate social responsibility: the nature of managerial capture. Accounting, Auditing & Accountability Journal, 16(4), 523-557. Parent, M. M. & Deephouse, D. L. (2007). A case study of stakeholder identification and prioritization by managers. Journal of Business Ethics, 75(1), 1-23. Perego, P., Kennedy, S., & Whiteman, G. (2016). A lot of icing but little cake? Taking integrated reporting forward. Journal of Cleaner Production, 136, 53-64. Scott, W. R. (1995). Institutions and organizations (Vol. 2). Thousand Oaks, CA: Sage. Simnett, R., & Huggins, A. L. (2015). Integrated reporting and assurance: where can research add value?. Sustainability Accounting, Management and Policy Journal, 6(1), 29-53. Stacchezzini, R., Melloni, G. & Lai, A. (2016). Sustainability management and reporting: the role of integrated reporting for communicating corporate sustainability management. Journal of Cleaner Production, 136, 102-110. Stubbs, W. & Higgins, C. (2014). Integrated reporting and internal mechanisms of change. Accounting, Auditing & Accountability Journal, 27(7), 1068-1089. Trevino, L. K. (1986). Ethical decision making in organizations: A person-situation interactionist model. Academy of management Review, 11(3), 601-617. This is a pre-publication version of an academic paper, entitled; “Measuring the corporate managers’ attitudes toward ISO’s social responsibility standard”, that was accepted by Total Quality Management and Business Excellence (Print ISSN: 1478-3363 Online ISSN: 1478-3371). The International Standards Organisation’s ISO 26000 on social responsibility supports organisations of all types and sizes in their responsibilities towards society and the environment. ISO 26000 recommends that organisations ought to follow its principles on accountability, transparency, ethical behaviours and fair operating practices that safeguard organisations and their stakeholders’ interests. Hence, this contribution presents a critical review of ISO 26000’s guiding principles. Afterwards, it appraises the business practitioners’ attitudes towards social responsibility practices, including organisational governance, human rights, labour practices, the environment, fair operating practices, consumer issues as well as community involvement and development. A principal component analysis has indicated that the executives were primarily committed to resolving grievances and on countering corruption. The results suggested that the respondents believed in social dialogue as they were willing to forge relationships with different stakeholders. Moreover, they were also concerned about environmental responsibility, particularly on mitigating climate change and sustainable consumption. In conclusion, this paper identifies the standard’s inherent limitations as it opens up future research avenues to academia. Keywords: ISO 26000; International Standards Organisation; Social Responsibility; Organisational Governance; Human Rights; Labour Practices; environmental responsibility; fair operating practices; consumer issues; community involvement. The International Standard Organisation’s ISO 26000 provides guidance on social responsibility issues for businesses and other entities. This standard comprises broad issues, comprising labour practices, conditions of employment, responsible supply chain management, responsible procurement of materials and resources, fair operating practices, recommendations for negotiations with interested parties as well as collaborative stakeholder engagement among other issues (Helms, Oliver, & Webb, 2012; Castka & Balzarova, 2008a, 2008b, 2008c). ISO 26000 is aimed at all organisations, regardless of their activity, size or location. Its core subjects respect the international norms and assist organisations on accountability, transparency and ethical behaviours. The social responsibility standard has emerged following lengthy partnerships’ agreements and negotiations between nongovernmental organisations (NGOs) and large multinational corporations (Helms et al., 2012; Boström & Halström, 2010; Castka & Balzarova, 2008a, 2008b, 2008c). Prior to ISO 26000, there were other certifiable and uncertifiable, multistakeholder standards and instruments; the Forest Stewardship Council (FSC), Greenpeace, Rainforest Alliance and Home Depot, among others (Balzarova & Castka, 2012; Castka & Corbett, 2016a). At the time, many organisations adopted voluntary environmental and social standards, as well as eco-labels such as ISO’s 14000, FSC, Fair Trade or the US Department of Agriculture’s USDA Organic Labelling. Like ISO 26000, their regulatory guidelines and principles encourage organisations and their stakeholders to become more socially responsible and environmentally sustainable. However, despite there are many standards and regulatory instruments, private businesses do not always provide credible information on their eco-labelling (Darnall, Ji, & Vazquez-Brust, 2016). For this reason, environmental NGOs are putting pressure on national governments for more stringent compliance regulations on large undertakings to adhere to certified standards or ecolabels (Schwartz & Tilling, 2009). This approach could possibly inhibit the businesses and other organisations to reveal relevant information about their social responsibility and stakeholder engagement (Castka & Corbett, 2016b). Notwithstanding, there is still limited research and scant empirical evidence on how businesses are resorting to ISO 26000’s principles in their responsible managerial practices (see Hahn, 2013; Hahn & Weidtmann, 2016; Claasen & Roloff, 2012; Castka & Balzarova, 2008a, 2008b)Therefore, this contribution provides a review of the socially responsible standard’s guiding principles and appraises the executives’ attitudes towards ISO 26000. Firstly, it examines relevant theoretical insights and empirical studies on the managerial perceptions towards responsible organisational behaviours. Secondly, it sheds light on the development of ISO’s standard on social responsibility and its constituent elements. Thirdly, this paper reveals the managers’ perceptions of ISO 26000’s core topics, including organisational governance, human rights, labour practices, the environment, fair operating practices, consumer issues as well as community involvement and development. This research uses a principal component analysis (PCA) to obtain a factor solution of a smaller set of salient variables from ISO 26000’s core issues. The findings identify specific socially responsible activities which are being emphasised by the companies’ executives. The results suggest that the respondents were committed to improving their relationships with employees, marketplace as well as political and community stakeholders. Several empirical studies have explored the managers’ attitudes towards and perceptions of corporate social responsibilities (Carollo & Guerci, 2017; Eweje & Sakaki, 2015; Moyeen & West, 2014; Fassin, Van Rossem, & Buelens, 2011; Pedersen, 2010; Basu & Palazzo, 2008; Nielsen & Thomsen, 2009 and Perrini, Russo, & Tencati, 2007, among others). A number of similar studies have gauged corporate social responsibility by adopting Fortune’s reputation index (Fryxell & Wang, 1994; Griffin & Mahon, 1997; Stanwick & Stanwick, 1998), the KLD index (Fombrun, 1998; Griffin & Mahon, 1997) or Van Riel and Fombrun’s (2007) RepTrak. Such measures required executives to assess the extent to which their company behaves responsibly towards the environment and the community (Fryxell & Wang, 1994). Despite their wide usage in past research, the appropriateness of these indices is still doubtful. For instance, Fortune’s reputation index failed to account for the multidimensionality of the corporate citizenship construct, and is suspected to be more significant of management quality than of corporate social performance (Waddock & Graves, 1997). Fortune’s past index suffered from the fact that its items were not based on theoretical arguments, as they did not appropriately represent the economic, legal, ethical and discretionary dimensions of the corporate citizenship construct. Human Resources Development Convention, Occupational Health and Safety Guidelines, Forced Labour Convention, Freedom of Association, Minimum Wage Fixing Recommendation and the Worst Forms of Child Labour Recommendation, among others. Moreover, ISO’s core subject on ‘human rights’ is based on the Universal Declaration of Human Rights (adopted by the UN General Assembly in 1948). The standard comprises seven essential areas in the realms of social responsibility: organisational governance, human rights, labour practices, environment, fair operating practices, consumer issues, and community involvement and development (ISO, 2014). ISO’s goal is to encourage organisations to integrate their guiding principles on social responsibility into their management strategies, systems and processes. Therefore, ISO 26000 assists in improving environmental, social and governance communications and also provides guidance on stakeholder identification and engagement (Camilleri, 2015a). It advises the practising organisations to take into account their varied stakeholders’ interests. According to Castka and Balzarova (2008a, p. 276), ‘ISO 26000 aims to assist organisations and their networks in addressing their social responsibilities as it provides practical guidance on how to operationalise CSR, by identifying and engaging with stakeholders and enhancing credibility of reports and claims made about CSR (Hąbek & Wolniak, 2016). Therefore, this standard has the potential to capture the context-specific nature of social responsibility. ISO 26000 has been characterised as an evolutionary step in standard innovation because it is suitable for organisations of all sizes and sectors. This standard has unique features regarding authority and legitimacy (Hahn, 2013). Its guidelines describe social responsibility as ‘the actions a firm takes to contribute to “sustainable development”’ (Perez-Baltres, Doh, Miller, & Pisani, 2012, p. 158). Hahn (2013) suggested that ISO 26000 offers specific guidance on many facets of CSR, as it helps responsible businesses in their internal and external assessments and evaluations. Furthermore, when the organisations adopt ISO 26000, they could signal their social responsibility credentials and qualities to their marketplace stakeholders (Graffin & Ward, 2010). This way they may also reduce information asymmetries among supply chain partners (King, Lenox, & Terlaak, 2005). ISO 26000 provides a unilateral understanding of social responsibility across the globe. It acknowledges that ‘social responsibility should be an integral part of the businesses’ core strategy (ISO, 2014). A wide array of social responsibility practices and stakeholder management issues are addressed in ISO 26000. This standard aims to unify and standardise social responsibility; it also acknowledges that each organisation has a responsibility to bear that are relevant to its business (Hąbek & Wolniak, 2016; Hahn, 2013). Notwithstanding, there are different industries, organisational settings, regional or cultural circumstances that will surely affect how entities implement the ISO standards ‘recommendations on responsible behaviours’. The corporate culture is an important driver for socially responsible activities. Therefore, CEOs play a key role in giving their face and voice to their corporate sustainability agenda (Waldman et al., 2006; Caprar & Neville, 2012). Hence, ISO 26000 can be used as a vehicle for CSR communication. Hąbek and Wolniak (2016) suggested that this standard is rooted in a quality management framework, as it holds potential to enhance the credibility of the corporations’ social responsibility claims. Similarly, Moratis (2015) argued that the concept of credibility relates to scepticism, trust and greenwashing. Other research has demonstrated that some stakeholders have used standards to enhance their credibility, learning and legitimacy (Hąbek & Wolniak, 2016; Boström & Halström, 2010). Consequently, the organisations that are renowned for their genuine CSR credentials could garner a better reputation and image among stakeholders. This will ultimately result in significant improvements to the firms’ bottom lines. An organisational culture that promotes the sustainability agenda has the potential to achieve a competitive advantage, as businesses could improve their long-term corporate financial performance (Eccles, Ioannou, & Serafeim, 2012) via the development of valuable, rare and non-imitable organisational resources and capabilities (Barney, 1986). Eccles et al. (2012) analysed the financial performance of firms with either high or low sustainability orientation. The authors found that firms with a high sustainability orientation were associated with distinct governance mechanisms for sustainability, longer time horizons and deeper stakeholder engagement, as they dedicated more attention to non-financial disclosures. Their adoption of the sustainability standards, such as ISO 26000, can also be interpreted as a signal of a responsible corporate culture (Waldman et al., 2006). On the other hand, many academic commentators argue that ISO 26000 has never been considered as a management standard. The certification requirements have not been incorporated into ISO 26000’s development and reinforcement process, unlike other standards, including ISO 9000 and ISO 14001(Hahn, 2013). In its present form, ISO 26000 does not follow a classical plan–do–check–act–type management system approach as it is the case for ISO 14001 (Hahn, 2013). Arimura, Darnall, and Katayama (2011) reported that the facilities that were certified with ISO’s 14000 were 40% more likely to assess their suppliers’ environmental performance and 50% more likely to require that their suppliers undertake specific environmental practices. Nevertheless, Arimura, Darnall, Ganguli, and Katayama (2016) argued that although ISO 14001 was a certifiable standard, the facilities that were adopting it were no more likely to reduce their air pollution emissions than noncertified ones. Rasche and Kell (2010) admitted that the responsibility standards can never be a complete solution to the perennial social and environmental problems; they argued that the standards have inherent limitations that need to be recognised. Certain prestandardisation preparations may have created boundaries which have restricted the stakeholders’ influence. Suchman (1995) described the pre-standardisation phase as an effort which embedded new structures and practices into already legitimate institutions. During the pre-standardisation discussions among stakeholders, there were differing opinions and not enough consensus over ISO 26000’s certification (Mueckenberger & Jastram, 2010). Other authors declared that the certification of standards does not necessarily lead to improved performance (Aravind & Christmann, 2011; King et al., 2005). The development of ISO 26000 involved lengthy, multi-stakeholder corroborations that did not necessarily ensure legitimacy or guarantee that the standard could be considered as an enforceable instrument for industry participants. Balzarova and Castka (2012) also pointed out that the scope of the ISO 26000 standard was unclear as the actual implications for social and environmental improvement were still unknown. Many stakeholders, including chief executives, should have been in a position to leverage their arguments during the pre-standardisation arrangements (Balzarova & Castka, 2012). The responsible businesses could have discussed possible avenues for the standard’s reinforcement. For instance, those organisations that are in complete compliance with ISO 26000 are not required to disclose their social responsibility reports and to make them readily accessible to stakeholders (Balzarova & Castka, 2012). This contentious issue could lead organisations to not fully conform themselves to this uncertifiable standard. Different industry representatives were (and are still) concerned that costly certification requirements could overburden organisations, particularly in emerging economies. The organisations’ stakeholders, including their employees, may be against the introduction of new standards as they could affect their firms’ bottom lines. When the standards are enforced, industry stakeholders need to comply with their requirements. The companies will usually have to absorb the cost of compliance with the standards (Delmas, 2002). Moreover, the standards may also lead to the creation of trade barriers and to significant increases in production costs (Montabon, Melnyk, Sroufe, & Calantone, 2000). Notwithstanding, when introducing new standards, the standard setters’ external audits could reveal regulatory non-compliance among adopting organisations (Schwartz & Tilling, 2009; Delmas, 2002). As a result, the industries’ implementation of a new standard such as ISO 26000 could be time-consuming because it may require holistic adaptations to change extant organisational processes. The standardisation of social responsibility has also been criticised for being costly and thereby difficult to implement, especially among the smaller companies (Toppinen et al., 2015). Ávila et al.’s (2013) survey indicated that ISO 26000’s themes were under-represented, particularly those involving labour practices and the environment. The authors posited that the organisations that were supposedly following ISO 26000 have often faced difficulties in incorporating the social responsibility throughout all organisational mechanisms, processes and decisions. Ávila et al. (2013) argued that the businesses’ unsatisfactory engagement with consumer issues was even more serious, as they justify the organisations’ existence. It may appear that Ávila et al.’s (2013) research participants were only concerned about their corporate image (as they were supposedly implementing the social responsibility concept and its premises). Evidently, these firms were less interested in undertaking necessary actions to ensure truthful and fair compliance with ISO 26000. This research has explored the senior executives’ stance on ISO’s social responsibility standard. The respondents were all employed by listed companies in a small European member country. They were expected to indicate their attitudes towards and perceptions of ISO 26000’s core topics, including organisational governance, human rights, labour practices, the environment, fair operating practices, consumer issues as well as community involvement and development. The questionnaire’s design, layout and content were consistent with the social responsibility standard. Respondents were asked to indicate the strength of their agreement or disagreement with ISO 26000’s subjects. The survey instrument made use of the five-point Likert scaling mechanism, where a numerical value was attributed to the informant’s opinion and perception. The responses were coded from 1 (strongly disagree) to 5 (strongly agree) with 3 signalling indecision. Such symmetric, equidistant scaling has provided an interval level of measurement. An online questionnaire link was sent electronically by means of an email, directly to the senior executives of all companies that were listed on the Malta Stock Exchange. There were numerous attempts to ensure that the questionnaire has been received by all email recipients. Many steps were taken to ensure a high response rate, which included reminder emails and numerous telephone calls. Eventually, there was a total of 374 (out of 1626) respondents who have willingly chosen to take part in this research. This sample represented a usable response rate of 23% of all targeted research participants. The surveyed respondents gave their socio-demographic details about their ‘role’, ‘age’, ‘gender’ and ‘education’ in the latter part of the survey questionnaire. The objective of this designated profile of owner-managers was to gain a good insight into their ability to make evaluative judgements in taking strategic decisions on social responsibility matters. Table 1 presents the profile of respondents who participated in this study. Following the data gathering process, the researcher carried out descriptive statistics to analyse the distribution and dispersion of the data. Afterwards, factor analysis (FA) data reduction techniques were used to achieve the desired reliability, timely and accurate assessment of the findings. Unless an instrument is reliable, it cannot be valid. The FA was developed to explore and discover the main construct or dimension in the data matrix. The primary objective of this analysis was to reduce the number of variables in the data-set and to detect any underlying structure between them (Hair, Anderson, Tatham, & Black, 1998). Therefore, FA identified the interrelationships among variables. FA extracted components to obtain a factor solution of a smaller set of salient variables which exhibited the highest variation from the linear combination of original variables (Hair et al., 1998). It then removed this variance and produced a second linear combination which explained the maximum proportion of the remaining variance. The first step was to decide which factor components were going to be retained in the PCA. This approach was considered appropriate as there were variables that shared close similarities and highly significant correlations. The criterion for retaining factors is that each retained component must have some sort of face validity and/or theoretical validity, but prior to the rotation process, it was impossible to interpret what each factor meant. The first component accounted for a fairly large amount of the total variance. Each succeeding component had smaller amounts of variance. Although a large number of components could be extracted, only the first few components will be important enough to be retained for interpretation. The SPSS default was set to keep any factor with an eigenvalue larger than 1.0. If a factor component displayed an eigenvalue less than 1.0, it would have explained less variance than the original variable. Once the factors have been chosen, the next step was to rotate them. The goal of rotation was to achieve what is called a ‘simple structure’, with high factor loadings on one factor and low loadings on all others. The factor loading refers to the correlation between each retained factor and each of the original variables. With regard to determining the significance of the factor loading, this study had followed the guidelines for identifying significant factor loadings based on the specific sample size, as suggested by Hair et al. (1998). The survey questionnaires’ responses were imported directly into SPSS. After filtering responses and eliminating unusable or incomplete survey observations, a total of 374 valid responses were obtained. The managers of the listed companies were required to indicate their level of agreement with ISO 26000 core subjects. Reliability and appropriate validity tests have been carried out during the analytical process. Cronbach’s alpha was calculated to test for the level of consistency among the items. Bartlett’s test of sphericity revealed sufficient correlation in the data-set to run a PCA since P< .001. The Kaiser–Meyer– Olkin’s Test (which measures the sampling adequacy) was also acceptable, as it was well above 0.5. With respect to scale reliability, all constructs were analysed for internal consistency by using Cronbach’s alpha. The composite reliability coefficient (Bagozzi & Yi, 1988) was 0.79, well above the minimum acceptance value of 0.7. PCA has been chosen to obtain a factor solution of a smaller set of salient variables, from a much larger data-set. A varimax rotation method was used to spread variability more evenly among the constructs. PCA was considered appropriate as there were variables exhibiting an underlying structure. Many variables shared close similarities as there were highly significant correlations. Therefore, PCA has identified the patterns within the data and expressed it by highlighting the relevant similarities (and differences) in each and every component. In the process, the data have been compressed as it was reduced in a number of dimensions without much loss of information. From SPSS, the PCA has produced a table which illustrated the amount of variance in the original variables (with their respective initial eigenvalues), which were accounted for every component. There was also a percentage of variance column which indicated the expressed ratio, as a percentage of the variance (for each component). A brief description of the extracted factor components, together with their eigenvalues and their respective percentage of variance, is provided in Table 2 . The sum of the eigenvalues equalled the number of components. Only principal components with eigenvalues greater than 1 were extracted, and they accounted for more than 63% variance before rotation. The PCA analysis yielded 17 extracted components from ISO 26000’s 37 variables. These factor components were labelled following a cross-examination of the variables with the higher loadings. Typically, the variables with the highest correlation scores had mostly contributed towards the make-up of the respective component. protection, anti-corruption as well as health and safety, among others (Camilleri, 2015a). In this light, ISO 26000 standard has been chosen to investigate company executives’ stance towards social responsibility practices. This empirical research suggests that the respondents’ responsible and sustainable behaviours were both internally and externally focused. The managers indicated that they were paying attention to their human rights issues, labour and fair operating practices. Table 2 reported that the executives gave due importance to resolving grievances and anti-corruption within their organisation. This finding is consistent with other contributions which link CSR with the human resources management literature (Currie, Gormley, Roche, & Teague, 2016; Hahn, 2013; Wettstein, 2012; Pedersen, 2010; Ewing, 1989). The workplace conflict may be intrinsic to the nature of work, because employees and managers may have hard-to-reconcile competing interests (Currie et al., 2016). Ewing (1989) argued that companies develop grievance procedures to help them in their due processes. The author maintained that its development leads to better morale and productivity, fewer union interventions and less likelihood of being sued. However, grievance procedures could incur operating costs, often consume large amounts of previous time from executives and may open the door to chronic malcontents. This study evidenced that the corporations’ managers were clearly against corrupt practices. Today’s listed businesses are increasingly expected to explain how they are fighting fraudulent activities and bribery issues. This study was conducted in a European Union jurisdiction which mandates a ‘comply or explain’ directive on non-financial reporting (Camilleri, 2015b). The European corporations are expected to be as transparent as possible, to disclose material information and to limit the pursuit of exploitative, unfair or deceptive practices (Camilleri, 2015b). Moreover, large organisations that are operating in member states (that have ratified the ILO’s conventions on labour rights) are morally and legally bound to promote fair operating practices and to engage in social dialogue. The findings suggest that the respondents were committed to forging relationships with different stakeholders, including suppliers and market intermediaries, the wider communities at large, as well as political groups, among others. Porter and Kramer (2011) contended that capable local suppliers foster greater logistical efficiency and ease of collaboration in areas, such as training, in order to boost productivity. Therefore, the success of every company is affected by supporting stakeholders and the extant infrastructure around it. The big businesses’ stakeholder engagement is rooted in institutional theory, as they are capable of aligning themselves with their broader context (Brammer, Jackson, & Matten, 2012). In fact, this study has also measured the respondents’ attitudes on social engagement (including the creation of jobs and skills development, the conditions of employment and the individuals’ civil and political rights) and on the subject of discrimination towards vulnerable groups, among other contingent topics. Moreover, the listed companies’ executives also indicated that they were concerned on environmental sustainability, particularly on global climate change. The corporations’ managers did not explain how they were committed to reduce the carbon footprint or prevent the emission of greenhouse gases. However, they may use new technologies, including renewable energy, water use and conservation. Alternatively, they could change older equipment to reduce pollution and make it more efficient and economical. The results suggest that respondents respected property rights, they utilised and consumed sustainable resources, and were concerned on protecting the natural environment. The extant literature has recognised this ISO 26000’s inherent limitations. For the time being, the businesses that are using this standard are not required to disclose material information on their social responsibility practices to stakeholders. One of the most contentious issues is that ISO 26000 still remains voluntary and uncertifiable. The practitioners may ultimately decide not to fully conform themselves with this standard, as they are not bound to do so. For this reason, ISO 26000’s role is still limited for regulators, standard-setting organisations and policy-makers. In a nutshell, this paper has advanced an empirical study that explored the business executives’ appraisal of social responsibility practices. It has employed ISO 26000 as a comprehensive measure for organisational governance, human rights, labour practices, the environment, fair operating practices, consumer issues, and community involvement and development. Moreover, this contribution has critically analysed key theoretical underpinnings and previous empirical studies on the social responsibility standard. Further research may yield other conclusions about how responsible organisations and corporations could use this standard to appraise their social responsibility endeavours. Future studies could explore different stakeholders’ views, other than the corporation executives’ stance on ISO 26000 subjects. Academia could utilise ISO’s broad standard as a measure for social responsibility behaviours. Moreover, qualitative research could clarify in depth and breadth how organisations are mapping their progress and advancement in the implementation and monitoring of the standard’s responsible initiatives. Future research could identify certain difficulties in incorporating the social responsibility standard throughout the organisational systems and processes. The author thanks this journal’s editor and his anonymous reviewers for their insightful remarks and suggestions. Boström M., & Hallström K.T.. (2010). NGO power in global social and environmental standard-setting. Global Environmental Politics, 10(4), 36–59. Castka , P., & Balzarova , M. A. (2008c). Social responsibility standardization: Guidance or reinforcement through certification? Human Systems Management, 27, 231–242. Claasen C., & Roloff J.. (2012). The link between responsibility and legitimacy: The case of De Beers in Namibia. Journal of Business Ethics, 107(3), 379–398. Eccles , R. G., Ioannou , I., & Serafeim , G. (2012). The impact of a corporate culture of sustainability on corporate behaviour and performance (No. W17950). National Bureau of Economic Research. Harvard Business School Working Paper, Cambridge, MA, USA. Ewing , D. W. (1989). Justice on the job: Resolving grievances in the nonunion workplace. Cambridge, MA: Harvard Business Press. Hair Jr., J. F., Anderson , R. E., Tatham , R. L., & Black , W. C. (1998). Multivariate data analysis (5th ed.). Upper Saddle River, NJ: Prentice Hall. Moratis , L. (2015). The credibility of corporate CSR claims: A taxonomy based on ISO 26000 and a research agenda. Total Quality Management & Business Excellence, 1–12. Perez-Baltres , L., Doh , J., Miller , V., & Pisani , M. (2012). Stakeholder pressures as determinants of CSR strategic choice: Why do firms choose symbolic versus substantive self-regulatory codes of conduct? Journal of Business Ethics, 110, 157–172. Porter , M., & Kramer , M. (2011). The big idea: Creating shared value. Harvard Business Review, 89(1/2), 62–77. Rasche , A., & Kell , G. (2010). The United Nations global compact: Achievements, trends and challenges. New York, NY: Cambridge University Press. Stanwick , P. A., & Stanwick , S. D. (1998). The relationship between corporate social performance, and organizational size, financial performance, and environmental performance: An empirical examination. Journal of Business Ethics, 17(2), 195–204. Suchman , M. C. (1995). Managing legitimacy: Strategic and institutional approaches. Academy of Management Review, 20, 571–610. Van Riel , C. B., & Fombrun , C. J. (2007). Essentials of corporate communication: Implementing practices for effective reputation management. Abingdon: Routledge. In the twentieth century, corporations were clearly distinguishing the difference between ownership and control of wealth. The business owners were considered as principals as they employed executives (agents) to manage their firms. The latter executives acted as agents for the principals, and they were morally responsible to maximise their shareholders’ wealth (i.e. the prinicipals’ wealth). The executives have accepted their agents’ status because they perceived the opportunity to maximise their own utility. The agency theory suggests that the company executives and their principals are motivated by opportunities for their own personal gain (Eisenhardt, 1989). Rightly so, the principals may invest their wealth in profitable companies and design governance systems in ways that maximise their investments. On the other hand, agents accept the responsibility of managing their principals’ undertakings to secure their employment prospects. However, at times, there may be interest divergence between the managers and their principals. There may be situations where the agents may feel constrained by their principals’ imposed structures and controlling mechanisms (Davis et al., 1997). This matter could lead to unproductivity outcomes and will ultimately bring significant losses to the principals themselves. In the event where the agent would have no discretion at all, the firm would be owner-managed. In this case, having a situation where principals are autocratic towards their agents could result in serious repercussions for the businesses’ prospects. The crux of the agency theory is that principals are expected to delegate authority to agents to act on their behalf (Ness & Mirza, 1991). It is this delegation that at times allows agents to opportunistically build their own utility at the expense of the principals’ utility. This happens when there are unaligned objectives; where managers may be motivated by their individualistic, self-serving goals, rather than being stewards for their principals (Eisenhardt, 1989). The stewardship theory is the collective-serving model of behaviour that is driven by the organisations’ intrinsic values and a genuine desire to do what is best for society and the planet (Donaldson & Davis, 1991). The stewardship behaviours benefit principals through the positive effects of profits on corporate dividends and share prices. Consequently, the stewards place higher value on cooperation than defection (these terms are also found in the game theory), because they perceive greater utility in cooperative behaviours. Stewardship theorists assume that there is a strong relationship between successful organisations and their principals’ satisfaction. The stewards protect and maximise their shareholders’ wealth because by so doing, they maximize their utility functions toward principals. Stewards who successfully improve their organisational performance will also satisfy other stakeholder groups who have their own vested interests. Therefore, pro-organisational stewards are motivated to maximise organisational performance, whilst satisfying the competing interests of shareholders. The utility that they gain from pro-organisational behaviours is higher than the utility that could be gained through individualistic, self-serving behaviours. This theory suggests that stewards believe that their interests are aligned with those of the corporation that engaged them (Muth & Donaldson, 1998). Ideally, the stewards ought to be committed to improve their organisational performance rather than satisfying their personal motivations. This theory’s ideals are closely aligned with <IR>’s principles for value creation. IIRC’s <IR> Framework emphasises the stewardship of multiple capitals, including; financial, manufactured, intellectual, human, social and natural capital. In the past, the accountability of social and environmental capitals has often been found to be completely lacking in financial reporting (Adams et al., 2016; Muth & Donaldson, 1998). In addition, some anecdotal evidence suggests that companies are not always presenting a true and fair view of their negative impacts. On the other hand, there are other organisations who may be reluctant to promote their responsible and sustainable behaviours. This may be due to a lack of awareness on the business case for such activities. The motivations for undertaking stewardship behaviours, including; material ESG initiatives (that may be reported within integrated reports) seem to fall into two increasingly converging camps: doing good practices (this is consistent with the predictions of the stewardship theory) or doing well (this is consistent with both institutional and legitimacy theories). Different components of the institutional theory explain how certain processes become established as authoritative guidelines for societal behaviours. Very often, structures and institutions are created, diffused, adopted, and adapted over space and time; and eventually they may also fall into decline and disuse. Unlike the efficiency-based theories which focus on profit maximisation or on the interactions between markets and governments, the institutional theory considers a wider range of variables that could influence the decision-making processes in organisations. This theory clarifies how firms respond to their institutional environments in which they operate. Stakeholders, including; governments, regulatory authorities, non-governmental organisations (NGOs), and organisations within the supply chain can exert their influence on any business. Scott (1995) held that, in order to survive, organisations must conform to norms and rules that are prevailing in their operating environment. Their compliance with the institutions’ formal regulations and ethos will earn them legitimacy among stakeholders (Beck et al., 2015; Dacin, 1997; Deephouse, 1996; Suchman, 1995). The institutional theory’s applications have expanded even further; as more research is showing how the institutions effect organisational behaviours, particularly on CSR issues. Historically, the notion of CSR has emerged from the institutionalised forms of social solidarity from liberal market economies. The institutional theory offers promising ways of investigating what lies at the heart of the publics’ concern. Therefore, corporations may be influenced by the institutions’ voluntary principles, policies and programmes. Their responsible behaviours have often been triggered by socio-political forces and pressure groups. In this case, CSR practice rests on the dichotomy between the corporations’ voluntary engagement and their socially binding responsibilities (Brammer et al., 2012). The fact that CSR is ‘voluntary’ is a clear reflection of the practicing organisations’ institutional context. Alternatively, CSR may be driven by legal, customary, religious or other defined institutions. Undoubtedly, numerous institutions have played a dynamic role, both individually and collectively in the development of integrated reporting. While governments have been the primary force for the promotion of financial reporting standards through security exchange commissions; other institutions like IIRC or GRI have facilitated the growth and diffusion of ESG reporting among practicing organisations. For the time being, it may appear that there is a demand for CSR reporting mechanisms by marketplace stakeholders. For this reason, corporations are communicating their ESG credentials (Camilleri, 2015a). This way, they are accountable and transparent about their modus operandi with regulators, industry, and stakeholder groups. Moreover, the corporations continuous engagement with external institutions, particularly multi-governmental organisations, social and environmental NGOs as well as the standard-setting organisations have brought valuable principles and guidelines in the realms of sustainability reporting (Camilleri, 2015a). Isomorphism has been constructed in conjunction with the applications of the institutional theory (Erlingsdottir & Lindberg 2005; Dacin, 1997; DiMaggio & Powell, 1991). This concept has largely been propagated through global cultural and associational processes. Isomorphic developments arise when ideas or innovations travel and are adopted in different contexts (Harding, 2012; Dacin, 1997; Deephouse, 1996).. For instance, despite all possible configurations of local economic forces, power relationships, and forms of traditional culture it might consist of, a previously-isolated island society that has made contact with the rest of the globe would quickly take on standardised forms that are similar to a hundred other nation-states around the world (Meyer, Boli, Thomas & Ramirez, 1997). Similarly, the notion of isopraxism refers to ideas that are translated and modified by different actors to suit their own needs. Isomorphism and its related notion, isopraxism are potentially helpful for framing our interpretation of why corporate reporting approaches may converge (or not) over time. For example, the principles-based and non-mandatory <IR> Framework could potentially create explicit and implicit reporting norms that shape the non-financial information of organisations that ought to be communicated through their integrated reporting. In this sense, isomorphism may be useful to understand how and why the disclosures of ESG content can become widely accepted across companies, over time (Adams et al., 2016; Deephouse, 1996). In a similar vein, isopraxism has been used to describe instances where identifiable institutional forces lead to new and different actions within specific organisational and social instances. Therefore, isopraxism suggests that organisations may be intrigued to move toward more integrated approaches to reporting. At times, legitimate organisations may be willing to voluntarily disclose their adapted ESG reports, out of their own volition. However, they may not necessarily label them ‘integrated’, or join the IIRC’s <IR> Framework (Erlingsdottir & Lindberg 2005; Harding 2012). Very often, the institutional environments provide regulatory frameworks and may be considered as a considerable breath of narratives pertaining to non-financial disclosures, in different jurisdictions. Hence, there is a possibility that responsible organisations will become legitimate if they comply with relevant societal rules that are found in the countries where they operate (Beck et al., 2015; Deegan, 2002). The stakeholders perceive that organisations are legitimate when “their actions are desirable, proper, or appropriate within some socially-constructed system of norms, values, beliefs, and definitions” (Suchman, 1995, p. 574). This conception suggests that the role of the legitimacy theory is to justify the organisations’ behaviour, particularly when they implement and develop social and environmental initiatives. It goes without saying that the stakeholders will recognise those legitimate organisations that are upholding their social contract in accordance with the expectations of society. Therefore, the drivers of institutional legitimacy may be influenced by the organisations’ external environment; according to the culturally-defined values and beliefs. On the other hand, stakeholders will severely sanction irresponsible organisations when they do not respect social norms and ethical values. Suchman (1995) described legitimacy as an operational resource assuming a “high level of managerial control over legitimating processes” (p. 576). Others suggested that legitimacy is strategic as it emanates from recurring conflicts between management and stakeholders (Dacin, Oliver & Roy, 2007; Suchman 1995). Organisational legitimacy could be achieved by forging strong relationships with external stakeholders (Camilleri, 2017). For this reason, organisations may decide to change and adapt their corporate disclosures according to their stakeholders’ expectations to achieve legitimacy. On the other hand, changes in disclosure patterns may be driven by internal decisions on materiality. Corporate reporting could be considered as a mitigating factor that is driven from inside the organisation (Campbell & Beck, 2004). Therefore, the managers’ agenda is to strategically enhance their legitimacy through stakeholder engagement. They may also make financial and ESG disclosures widely available to interested parties to achieve legitimation. This position is consistent with <IR>’s framework. Within this context, the <IR> framework provides significant support to organisations who are willing to disclose their non-financial reports. However, when organisations utilise IIRC’s framework for their very first time, they may inevitably have to adapt their financial and ESG reports as per <IR>’s recommended framework. Hence, <IR>’s reporting guidelines provide a passive avenue for institutional legitimsation. It is through the development of such guiding principles that society and external stakeholders are continuously influencing organisations to restore their ethical and social disclosures (Campbell & Beck, 2004). The conditions for legitimacy are often constructed by responsible organisational behaviours. For example, relevant research on the legitimacy theory reported that there were organisations who were voluntarily disclosing their non-financial reports. Companies were seeking external legitimation by reporting their environmental performance (Brown & Deegan, 1998). Other corporations who decided to follow GRI’s reporting guidelines or resorted to the <IR>’s framework were increasingly aligning their internal reflections with external outputs (Beck et al., 2015). Initially, the rationale behind their integrated reporting was to improve their organisations’ external legitimation among stakeholders. However, at a later stage they realised that their external reports were informed by their organisation’s strategic positioning, and not constrained by the promulgation of the voluntary guidelines (Beck et al., 2015). Evidently, more organisations are conforming to the prevailing definitions of legitimacy through their disclosures of responsible and sustainable actions. Consequently, these responsible organisations’ leadership sets the agenda for stakeholder engagement and ESG reporting. The underlying objective is to build or enhance reputation (Aerts & Cormier, 2009) that will positively impact on the organisations’ capital flows. This is an excerpt from my latest working paper, “Theoretical Insights on Integrated Reporting: Valuing the Financial, Social and Sustainability Disclosures”. Corporate sustainability and responsibility focuses on exploiting opportunities that reconcile differing stakeholder demands as many corporations out there are investing in corporate sustainability and responsible business practices (Camilleri , 2017b). Their active engagement with multiple stakeholders (both internal and external stakeholders) will ultimately create synergistic value for all (Camilleri, 2017a). Multinational organizations are under increased pressures from stakeholders (particularly customers and consumer associations) to revisit their numerous processes in their value chain activities. Each stage of the company’s production process, from the supply chain to the transformation of resources could add value to their businesses’ operational costs as they produce end-products. However, the businesses are always expected to be responsible in their internal processes, toward their employees or toward their suppliers’ labour force. Therefore, this corporate sustainability and responsibility perspective demands that businesses create economic and societal value by re-aligning their corporate objectives with stakeholder management and environmental responsibility. In sum, corporate sustainability and responsibility may only happen when companies demonstrate their genuine willingness to add corporate responsible dimensions and stakeholder engagement to their value propositions. This occurs when businesses opt for responsible managerial practices that are integral to their overall corporate strategy. These strategic behaviours create opportunities for them to improve the well-being of stakeholders as they reduce negative externalities on the environment. The negative externalities can be eliminated by developing integrated approaches that are driven by ethical and sustainability principles. Very often, multinational businesses are in a position to mitigate risk and to avoid inconveniences to third parties. For instance, major accidents including BP’s Deep Horizon oil spill in 2010; or the collapse of Primark’s Rana Plaza factory in Bangladesh, back in 2013 could have been prevented if the big businesses were responsible beforehand. In conclusion, the corporate sustainability and responsibility construct is about embedding sustainability and responsibility by seeking out and connecting with the stakeholders’ varied interests. As firms reap profits and grow, there is a possibility that they generate virtuous circles of positive multiplier effects (Camilleri, 2017a). Therefore, corporate sustainability and responsibility can be considered as strategic in its intents and purposes. Indeed, the businesses are capable of being socially and environmentally responsible ‘citizens’ as they are doing well, economically. 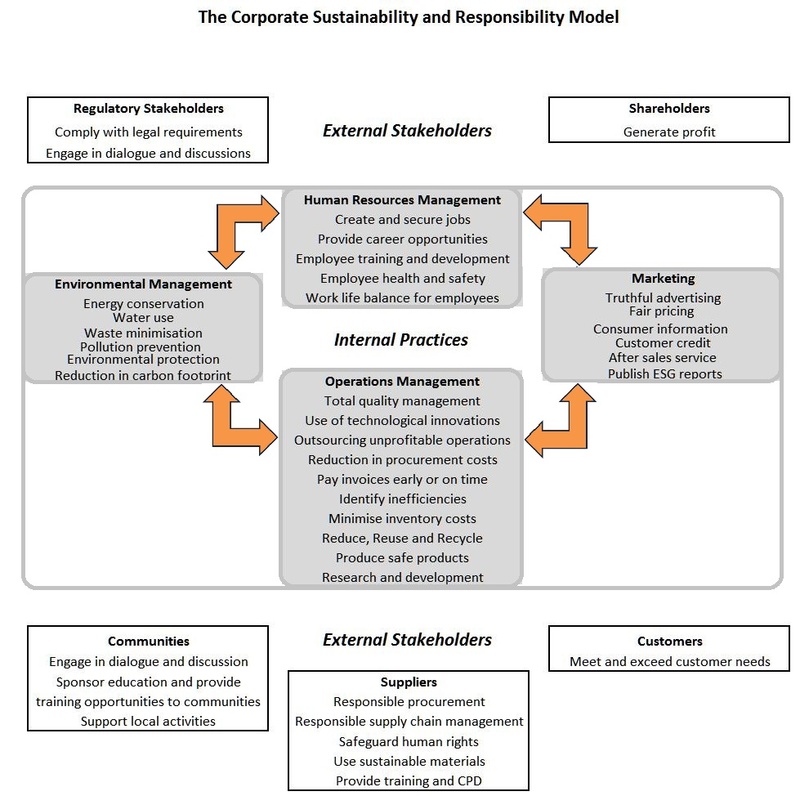 This contribution explains the foundations for corporate sustainability and responsibility. Although this concept is still evolving; the debate among academic commentators is slowly but surely raising awareness on responsible managerial practices and on the skills and competences that are needed to deliver strategic results that create value for businesses, society and the environment. Carroll, A. B., & Shabana, K. M. (2010). The business case for corporate social responsibility: A review of concepts, research and practice. International journal of management reviews, 12(1), 85-105. Fombrun, C. J. (2005). A world of reputation research, analysis and thinking—building corporate reputation through CSR initiatives: evolving standards. Corporate Reputation Review, 8(1), 7-12. Freeman, R.E. (1984). Strategic Management: A stakeholder approach. Pitman, Boston, MA. USA. Porter, M. E. & Kramer, M. R., (2011). Creating shared value. Harvard business review, 89 (1/2), 62-77. *This offer is valid from 1st April to 1st May 2017. This business text-book can be purchased from Springer or Amazon.